Wrong way accidents in Hollywood and South Florida are terrifying. One minute, you may be happily driving your car down the highway or road and the next instant you may be facing a car speeding towards you in your lane. You may not have enough time to react, and the resulting head-on collision in Hollywood or your community can be serious enough to claim lives. The interesting thing about wrong way accidents is that they really shouldn’t happen at all. All drivers are carefully instructed to stay in their lanes when driving and road signs clearly indicate the direction of traffic to prevent wrong way accidents. On highways, medians, large signs, and other design features are often in place to help prevent wrong way crash. About 350 Americans die due to wrong way collisions each year, according to the US Department of Transportation. While this is a relatively small number compared to the tens of thousands who die from car accidents caused by other reasons, the reality is that wrong way collisions are always completely preventable and there really shouldn’t be anyone losing their life due to these types of accidents. Drunk driving is the leading cause of wrong way accidents, according to the National Transportation Safety Board. 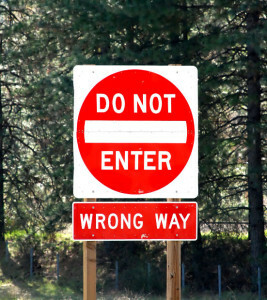 Inebriated drivers may simply not notice or obey signs telling them that they’re headed the wrong way. Drunk drivers may also a more likely to fall asleep at the wheel, meaning they can enter oncoming lanes. Elderly drivers are more likely to cause wrong way accidents when compared with other age groups and they are overrepresented among at-fault drivers in wrong way collisions. There’s some speculation about why this is. Condition such as dementia as well as vision problems, some speculate, may affect elderly drivers’ ability to discern signs. Most wrong way collisions happen on exit ramps. These types of areas may be riskier for collisions because of poor signs or because there is less traffic flow showing drivers which way they should be headed. Drivers on highways may not be from the area and may be unfamiliar with specific ramps. Unfortunately, because of the higher speeds on highways, wrong way collisions on highway ramps can be especially deadly. 4) Night driving and weekend driving. Safety experts believe that drunk driving is more common during the weekends and at night, which may be one reason why a large percentage of wrong way collisions occur during these times. While many wrong way crashes are single vehicle collisions, wrong way drivers can crash head-on into other vehicles rightfully traveling in the correct lane. In addition, the innocent passengers of wrong way drivers can be injured if an accident occurs. In both of these cases, victims may be able to sue the at-fault driver for their recklessness and negligence. If you have been injured in a wrong way crash, don’t hesitate to contact Flaxman Law Group for a free consultation to find out whether you have a claim or other legal options for seeking compensation for your injuries, lost income, and other losses.